hey jen renee: life looks like this. Biggest change/upgrade for 2010 for Bo and I? New phones. I know ... this is so not a big deal, but we have joined the 20th Century and now have text messaging. This is major for me since I'm not a huge phone-talker. And Pandora on my phone? Awesome. Texts from Yana and Erin and Vee? Triple awesome. Just busted out this kit (finally!) from The Dozens. There are so many rad things inside and I can't wait to have a couple of hours to mess around with it. 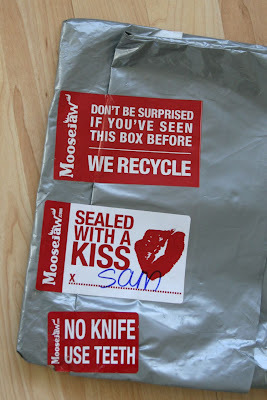 Best packaging in the universe = Moosejaw. 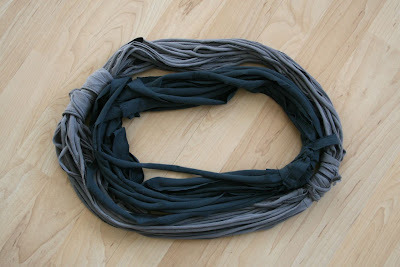 This week, I tried to make a t-shirt scarf/necklace thing. New project on the needles = Oatmeal Pullover by Jane Richmond. Mine is going to be in the Lion Brand snapdragon/moss color, my fave shade of green. Best artwork of 2010, by little Lo. 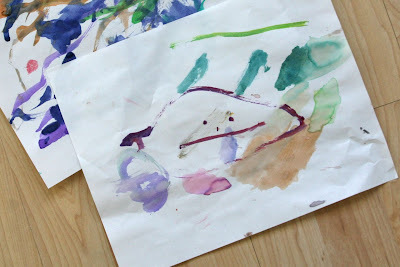 She draws and paints faces on every piece of paper I give her, and I want to keep them all. 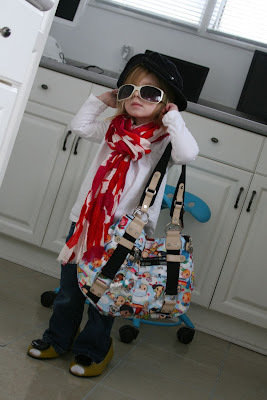 Cold winter days = adventures in mom's closet. Watch out, Mary-Kate and Ashley. 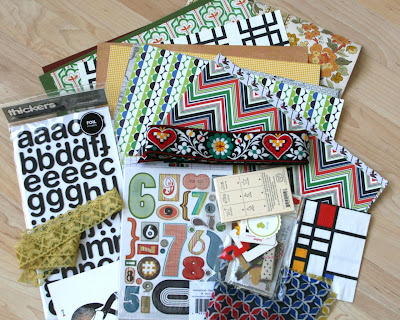 It has been so much fun – serious fun – sending out new knitters into the cold, wintry night. Our last group of girls was such a blast; there was a lot of joking and storytelling going on along with the dropped stitches and first few rows of knitted success. I wouldn't consider myself a teacher at all, but this is more like conversation (with a little bit of instruction) anyway. It's good, and being able to share this hobby is golden. 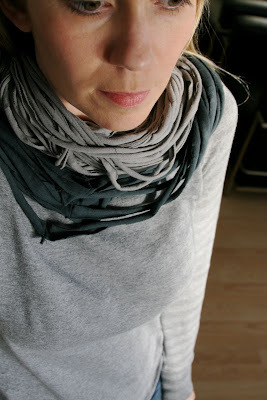 1) I like the scarfy-necklace. I think it would be a hit in CO, at least in my casa. b) Those are the best kind of teachers- the ones that teach others without them realizing they've been taught. Word. III) I like everything else in your post also. Hey Jen! Were you inspired by NECKLUSH on etsy? I bought one and it is really cool! Yours looks awesome! sigh.... this all makes me miss ya like crazy. LOVE the calendar!!! 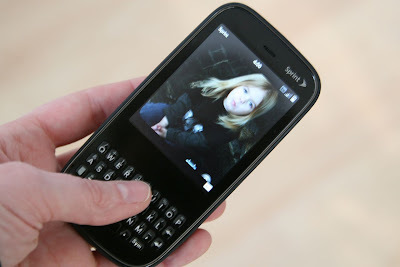 hee-hee...welcome to the world of texting..i swear i can't live without it...you need to text me some time! 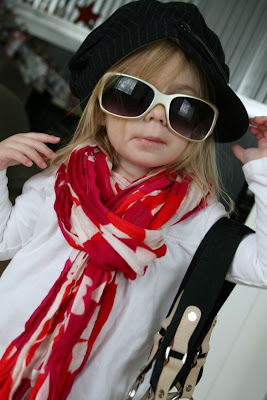 love the pic of Lo all dressed up in mamma's clothes..so stinkin' cute!! Jen is texting now?? YIPPEEE!!!! Me and Will have moved up in the world to, we just ordered some new phones and new service. 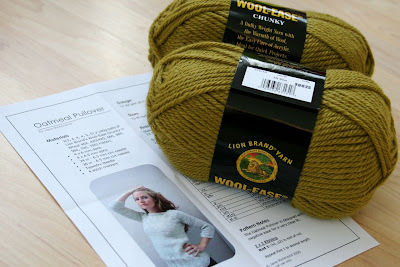 We will have to exchange numbers(if yours has changed, mine is going to) Loved this post and I am looking forward to seeing your finished sweater! Miss you!!!!! They've recently started a knitting club in one of my local pubs - it's lovely to meet some like minded people and just hang out together knitting. if i lived anywhere near you i would love to take your class! and that green wool is very nice! i really like the t-shirt scarf! Tutorial please? 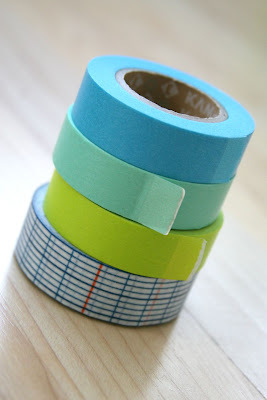 i totally need some washi tapes! p.s. i can't believe you are only just texting?!?! hey jen! i just discovered your blog and i love it!!! keep up the good work. 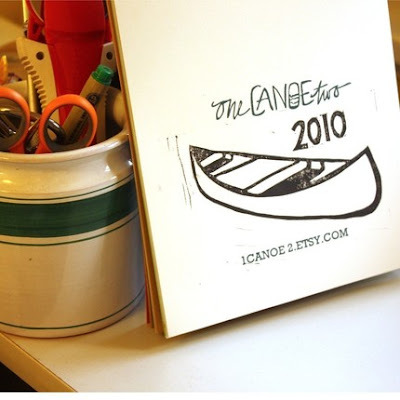 by the way, I saw that 1canoe2 calender at renegade and have been wanting ever since!!! i'm so jealous! I want to take your knitting class! and that art from Lo is awesome! As creative as her mom. I ordered that Dozen's kit, too, I'm hoping to get it soon!